[SatNews] Never one to shrink from tackling an intensive subject, this report will delve into many aspects of this industry. 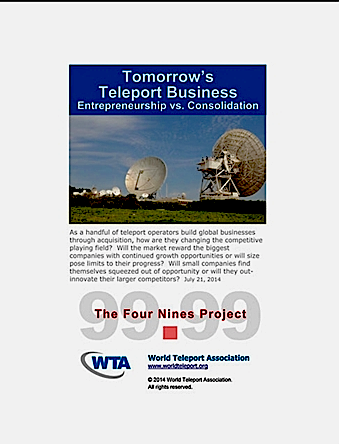 World Teleport Association (WTA) tackles the subject of, what is the future of the teleport industry? Is it a race for scale that only the biggest and most geographically diverse will have a meaningful competitive advantage, or is the future with the nimble entrepreneur who identifies unmet needs and drives deep into profitable niches in the market? This research covers the possibility that a handful of teleport operators will build global businesses through acquisition, and the process in which they are changing the competitive playing field. They question if the market rewards the biggest companies with continued growth opportunities will size pose limits to their progress? Will small companies find themselves squeezed out of opportunity or will they out innovate their larger competitors? The report that will provide many answers to these questions is Tomorrow’s Teleport Business Entrepreneurship vs. Consolidation.An introduction to the subject matter discusses the fact that most teleports are small-to-midsize businesses growing organically over the years, and referred to as the Entrepreneurs. But a few operators have found ways to grow significantly within a matter of years by raising funds for ambitious development, acquiring businesses and building a global footprint, and these operators are called the Multinationals. Tomorrow’s Teleport Business explores the opportunities and challenges facing the independent teleport operator in today's marketplace, where serial acquirers are building global businesses that deliver one-stop, end-to-end service to the world’s multinational media, maritime, resource, energy and governmental organizations. Though they lack scale and buying power, the Entrepreneurs continue to deliver significant innovation in applications, technology and operations, which Multinationals with large installed customer bases can find hard to do. Will the market reward the biggest companies with continued growth opportunities or will size pose limits to their progress? Will small companies find themselves squeezed out of opportunity or will they out-innovate and out-perform their larger competitors?